Leave the Outside World behind, submerge into Cerebria and shape the future of the Inside World in a 2-4 player area-control team game Cerebria: The Inside World. Assume the role of Cerebria's Spirits associated with either Bliss or Gloom, and invoke Emotion cards with various intensities and abilities to occupy important areas on the main board. The game comes with a Solo and 2 Player co-op mode. Spirits are available as Miniatures as part of the Forces of Balance expansion (available as part of the bundle), which expands the game to 5-6 Players, and adds a new 3 Player mode with a completely new Faction to play with. 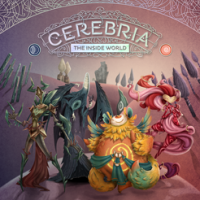 Add a Review for "Cerebria: The Inside World"